Top reviewed RV parks in Montana reveal the best sides of Big Sky Country. Spend any amount of time exploring Montana and you’ll discover just how refreshingly wild and unpolluted the Big Sky State really is. Spiny mountains and rocky foothills spill into undulating valleys that are dotted with rustic ranches and sparkling glacier-fed lakes. This is still frontier country, through and through. Montana is also one of the least populated states in the country, with one of the lowest population-per-square-mile ratios in the U.S. The three big cities here are Billings (population: 100,000), Missoula (population: 66,000) and Great Falls (population: 58,000). Those low numbers mean more wide-open spaces and more adventure for travelers. 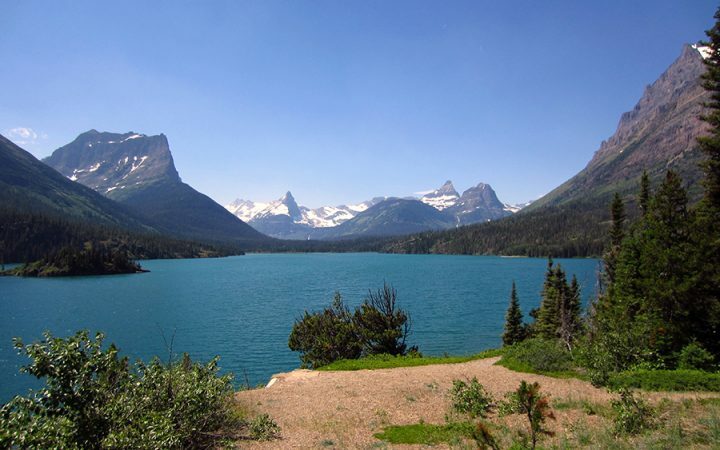 Most of your time will be spent exploring Montana’s selection of incredible national and state parks, including world-famous Glacier National Park, spine-tingling Lewis and Clark Caverns State Park and mesmerizing Giant Springs State Park. But don’t miss some of the other big attractions either, such as the Grizzly and Wolf Discovery Center in West Yellowstone, the Carousel for Missoula, and the Lewis and Clark National Historic Trail Interpretive Center in Great Falls. Set foot in just about any direction in Montana and you’ll likely find yourself somewhere wild and gorgeous. The northwestern corner of the state is home to the crown jewel of the Montana park system—Glacer National Park. Sprawling across more than a million acres, the park is home to 740-miles worth of regularly maintained hiking trails that snake deep through lush forests and around crystal-clear mountain lakes. It’s also home to the Going-to-the-Sun Road, a 52-mile scenic byway that shows off the park’s best views. In the southwestern corner of the state is Lewis and Clark Caverns State Park, home to one of the largest limestone caverns in the U.S. Guided tours bring visitors through the cavern system, which is full of surreal rock formations like stalactites, stalagmites and helictites. The park also has hiking trails and hunting areas. If you find yourself in the scenic town of Great Falls, you’ll be only a stone’s throw away from one of the finest parks in the state—Giant Springs State Park, home to gorgeous freshwater springs that were first discovered by Lewis and Clark. Check out more articles about Montana RV travel. Learn about RV park reviews here.